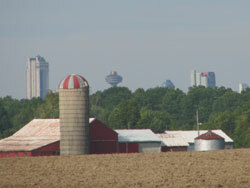 The Official Plan for the Niagara Falls Planning Area is a document with a 20 year vision outling long term objectives and policies of the City with respect to the growth and development of urban lands, the protection of agricultural lands and the conservation of natural heritage areas; and the provision of necessary infrastructure. The Official Plan is a dynamic document that is constantly updated and revised to reflect the evolvoing nature of the city and its environs. Amendments to the Plan can be City or privately initiated. The Ontario Planning Act requires that the Official Plan be reviewed every five years to keep it current. The following reviews are currently underway. The City is initiating amendments to the Official Plan and Zoning By-law to implement the Province's direction to permit the establishment of accessory dwelling units within single detached, semi-detached and townhouse dwellings. Associated with this is a zoning by-law amendment to delete references to the word 'family' within the text of By-law No. 79-200. Work is currently progressing on updates to several sections of the Plan including Commercial and Tourist Commercial policies. Work is underway on minor amendments and revisions to the Plan. The Official Plan may be amended through private applications for development proposals that area a substantive change in policy direction. You can visit our Events and Notices page for information on application currently being considered. Official Plan amendment applications can be found on our Application Forms page. Secondary Plans are comprehensive land use, transportation and servicing policy plans for sub-areas of the City that indicate, in detail, how the policies and land use designations of the official Plan are to be implemented in that area.